Recently, I have been waking up in a funky, rather dreary mood. This happens naturally I’m sure to most of us sometimes, but these episodes have become more frequent as of late. I let this sort of slip by for a few months. I thought it was just seasonal change, or aging (always a good catch-all category), until I became alarmed when realizing the one thing I really looked forward to each day was watching reruns of The Big Valley on MeTV. True, Peter Breck, Richard Long and Lee Majors were some of the most attractive cowboys I ever did see sitting in saddles, (except of course for the Oklahoma cowboy whose last name I share). Still, I was becoming less and less joyful and more and more heavy in spirit. Some might even say I was grouchy, what? But, what’s a person to do? Like many others, I turned to social networking to read how others were coping in a time of toxic election ads, news of young people killing young people in fields and theaters and natural disaster after natural disaster all around the globe. To my great sadness, I found many entries on FB were brutal, vulgar, accusatory and disrespectful. This of course did not apply to all entries, but enough so I felt doubly brutalized by social networking, (the communication tool of the future? Oh goody!). I kept asking myself what happened to respectful dialogue even in differences? And why did discussions have to result in loss of dignity and integrity for the speaker and the listener? Then yesterday a friend of mine, Mike, offered something on Facebook that answered my questions with such deeply palpable truth, I asked him if I could share it with my blog readers? He granted me permission. Thank you, Mike. 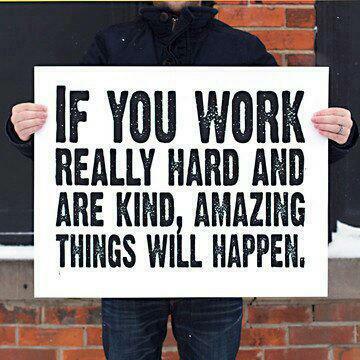 He posted a picture of a sign that said, “If you work really hard and are kind, amazing things will happen.” Really? Is that possibly true in a world where it sometimes appears our efforts make no difference and that we are already working harder than ever just to stay sane? As I read the thread of comments, including a few from Mike, the light went on. I understood that from his point of view, the work isn’t about what is outwardly and physically available for public viewing. The work is inside of him. I got to thinking about this. Now, could it be that I was working hard on externals and expecting my rewards to result in the cowboy always riding off with the pretty girl or the family always sitting down with laughter at the end of a trying day to enjoy imported sherry and roasted hens? Well, that’s what the Barkleys did in the Big Valley. Or could it be about putting efforts into cultivating an individual posture that discourages returning unkindness for unkindness and encourages work at retaining and protecting integrity, dignity and respect in our world, period? Well, that is very hard work indeed. I was reminded that this personal, internal work needs to be done regularly so the stuff and stuff coming at me from all angles will not diminish my integrity and lead me to justify diminishing the integrity of others. I admit that sometimes this work is harder than what I want to engage in. I would much rather watch every disagreement or problem resolve itself by trotting happily into the sunset without a lot of effort on my part. After all, no effort on my part means minimal blame on my person, no? I saw this FB post as an interesting challenge. Mike, in essence, said working hard and being kind in all his interactions allows him, at the end of the day, to look in the mirror and be satisfied that his personal integrity is intact. That is a pretty amazing gift he can give to himself. And what a payoff for his labor. Oh, how right you are my friend. It is a gift no one else can give us and when strengthened, no one can take from us. If we reflect this inward self to the outward world, maybe, just maybe we can stop the exchange of toxins robbing us all of our humanity. I’m rolling up my sleeves, friends. I’ve got some work to do. Wanta join me?